Of course this story is obviously fictitious, because I only have sons (and my genes seem to tell me that I'll likely only ever have sons). Nonetheless, I wanted to bring people along on a trip to watch my daughter grow up. In helping to design a new expansion, there are always cards that I get particularly attached to. These are the ones that I feel are especially inspired, or for which everything just seems to fit. Being a big fan of "Trek sense" on cards, these are generally also cards that have a generous helping of that characteristic, ones where the storyline dictates the gametext. Of course, just because something starts out that way doesn't always mean that it will end up that way. Such was the case when it came to one of my favourite cards from This Side of Paradise, the Prodigal Daughter. And so, a daughter was born. She 'rejoined' the collective, but mostly just to save her friends. Should not have the Drone keyword because she remained a unique individual. Ultimately defected against 'her Queen.' She should have one of those abilities that could make her go away at any time. Like Ezri Tigan, only different. At the start of your turn, if this personnel is present with your opponent's personnel, your opponent now commands this personnel. "I wish to stay. I intend to rejoin the Collective." 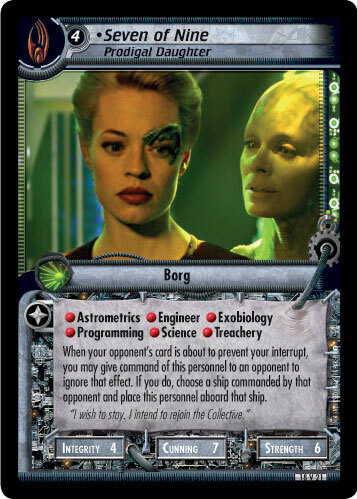 The basic idea here was that The Borg would play her because she's a free personnel with a lot of skills (including Treachery). The opponent would try to steal her because it's easy to do and would result in a good personnel with a lot of skills, while simultaneously denying an opponent a good personnel with a lot of skills. And then The Borg would have a chance to assimilate some people that had tried to kidnap Seven, thus promoting positive interaction between the two players. By the time we went to the playtesters with version A for testing, very little had changed with this card. The cost went up to 2 (because it was a bit too good of a card to be completely free, even with the chance of losing it), and the gametext was clarified to work in the multiplayer environment (when you have more than one opponent). However, we started to get reports back from the playtesters that she was completely useless. The way the gametext was written, she was just bouncing back and forth between the two players. The Borg would play her, and beam her to a planet to attempt a mission. The opponent would come by and leave somebody there to grab her before The Borg could use her again. She would then switch sides to the opponent, but at the end of the Borg turn he'd make sure that there was still somebody there with her. So at the start of the non-Borg turn, she jumps back to the Borg side, and on and on. 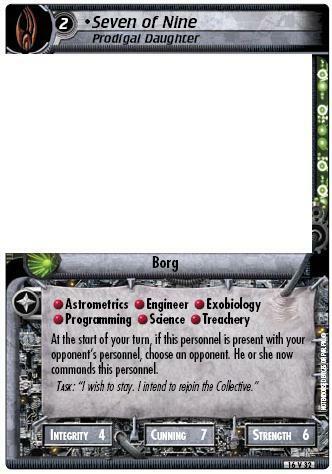 Basically, if the Borg player didn't have cards to assimilate anybody, then the opponent could neutralize the personnel for the entire game just by leaving a peon on the planet. Not really the intent of the card, and just caused a lot of headaches. After a few rounds of playtesting it that way without it working properly, the gametext was changed. Now she would run off to somebody's ship when she was kidnapped. This meant that the peon sent to liberate her would still be stuck on the planet (to be assimilated, if desired by the Borg player), but she was no longer present with the Borg to bounce back and forth. So now the non-Borg player could grab her, take her away, use her for a while, and then the Borg would have to send somebody to reclaim her into the Collective later on. We tried this for about a month, but something still wasn't working about it. The biggest question we heard was "Why?". Why bother to send somebody to grab her? Why bother to send somebody to retrieve her? What was the point? What was the reward? Apparently a six-skill personnel for free (and denying your opponent the same) just isn't enough to please anybody these days. So at that point, she was cut from the playtest file for a couple weeks while we hit the drawing board again. It was time for a significantly different idea. The original plan just wasn't working, but I wasn't quite ready to give up on her yet. Unfortunately it was getting late enough in the playtesting cycle that she basically had one more chance to get into the expansion. If the new gametext didn't work out, she'd be cut out and replaced by something much less risky, because there wasn't time left to properly playtest anything that would push the boundaries. 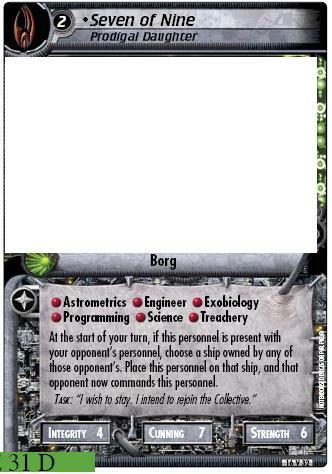 I liked the idea of her moving around between opponents, as she defected from the Borg to Voyager to the Borg and back. But the whole plan to promote interaction just wasn't working. So instead, I looked at the questions we'd been getting. Where was the reward? Well, we could build the reward right into it, by flipping things around. Instead of the defection being an effect, it could be a cost to gain an effect. But what? Well, since the Borg tend to enjoy Interrupts (using them to Analyze and Adapt to dilemmas, and even assimilate personnel), why not tie it into that? In this case, she can prevent your interrupts from being negated, making sure that when it's really important that you Adapt to that dilemma, you can. The cost of it is the personnel herself as you have to give her over to your opponent. Of course, that then means that he or she has a similar chance to protect his own interrupts and give her back. And back and forth she goes, helping out whomever needs her help. Of course, since the defection is the cost of using her ability, it means that if you give her away and then play a second copy, neither player (in a two-player game) can then use her ability. But you'll both still have a pretty nice personnel to use in your mission attempt, at least.